The unique Bordeaux barrel made by the Lalique crystal works and costing hundreds of thousands of euros takes pride of place in the cellars of Château Lafaurie-Peyraguey in Sauternes. It is the result of two years of meticulous craftsmanship. In some ways, it is taking technology to the extreme. Reproducing the wood grain on its translucent staves, the barrel combines crystal with glass for its body, leather for its hoops and crystal for its nails. “I can't say how much it is... But it's the most expensive barrel in the world”, commented David Bolzan, the vineyard manager of Swiss investor Silvio Denz, who incidentally has owned Lalique since 2008, and Lafaurie-Peyraguey since 2013. With 2,000 hours of work and a unique mould made for the occasion, the cost of manufacturing the crystal barrel reportedly totals hundreds of thousands of euros. Its fragility and weight - 400 kilos - means it cannot be moved. In any case, the crystal barrel is not designed to mature wine, like a barrel made from classic oak, but rather as a showcase. It is filled with 2013 Sauternes from Château Lafaurie Peyraguey, the first vintage made on the estate by Silvio Denz. 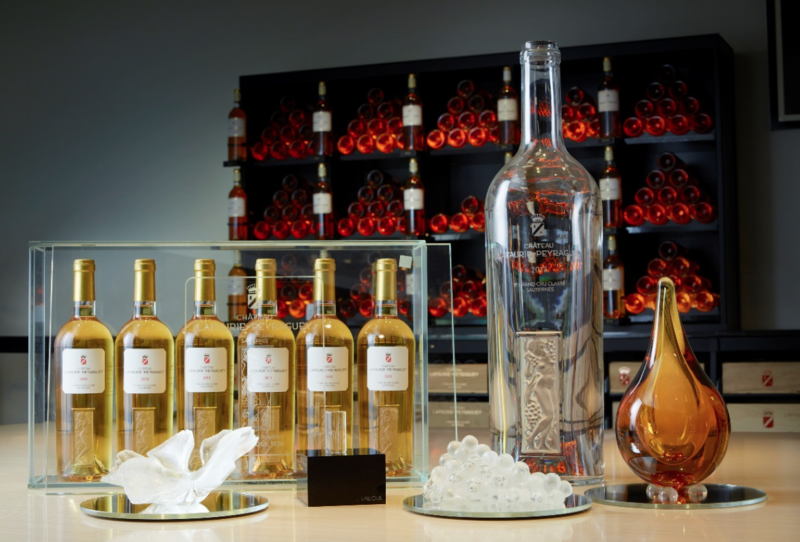 The impressive crystal barrel is just one of several pieces in the ‘DNA of Wine’ series created by Lalique for Château Lafaurie-Peyraguey, and its luxury hotel and restaurant. The crystal creations focus on each stage of wine production, from the Semillon leaf to the case of six bottles, including the bunch of (non botrytised) grapes, the golden (tinged) drop, the bottle (a five-litre jeroboam) and the cork, not to mention the barrel bung.